Since 1776, San Francisco’s Presidio has been a stronghold for the city—first founded as a military fort by the Spanish, it became a landmark for California settlement and expansion, and later one of the largest US. Army posts in the country. Then in 1994, it became part of the National Park Service, sharing its wealth of treasures with the public. 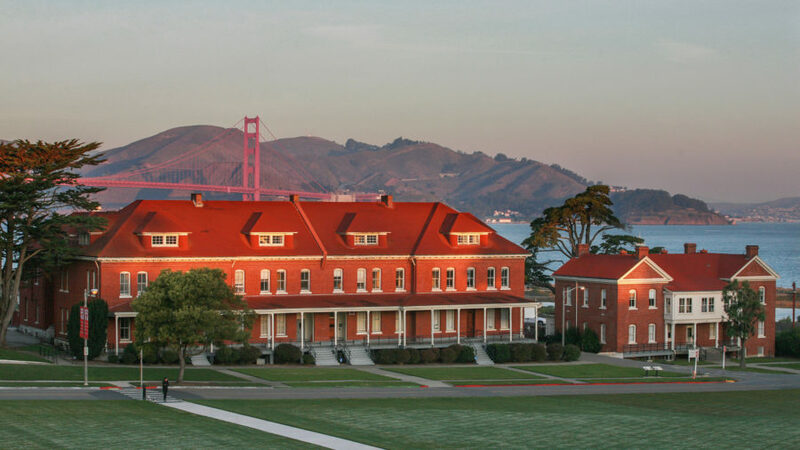 Today, the Presidio, neighbors with the breathtaking San Francisco Bay, boasts 24 miles of trails through pine and eucalyptus, a crop of noteworthy eateries and weekly food truck festivals, cultural happenings like the Walt Disney Family Museum and the headquarters of Lucasfilm, a bowling alley, and now, two iconic hotels. This summer, the Presidio Trust is opening its second boutique hotel on the property, as a sister property to the iconic Inn at the Presidio. Housed in former 1890s U.S. Army Barracks which hosted recovering soldiers during wartime and later officers-in-training, the Lodge at the Presidio has been reimagined with all of the comforts of a modern boutique hotel, sans artillery. With thoughtful attention to historic details and the sweeping bay views surrounding the park, the 42-room hotel’s aesthetic combines timeless touches like memorabilia with the stunning scenery. From the grand dining room (formerly the mess hall) complete with a cozy fireplace and board games, to the porch’s rocking chairs and garden courtyard, the Lodge aims to provide old San Francisco hospitality to modern travelers. Think nightly wine and cheese receptions, firepits on the patio, an upscale complimentary breakfast, and in-room massages upon request. When you’re ready to venture into the City by the Bay, the visitor center next door provides intel on the sights within and surrounding the 1,500-acre park, and even offers a free shuttle to downtown. The closest San Francisco hotel to the Golden Gate Bridge, the Lodge officially opens to the public June 28, but reservations are available online. If its sister hotel’s consistent ninety-plus percent occupancy rate over its past six years in business is any indication, we have a feeling bookings will go quickly.